Uniformly dispersed nanoparticles such as silver or graphene with an precisely tailored particle size are crucial for production highly conductive inks. Powerful ultrasonic dispersers allow to synthesize, deagglomerate and distribute metallic (e.g. Ag), carbon-based (e.g. CNTs, graphene) nanoparticles as well as nanocomposites with excellent electrical conductivity. 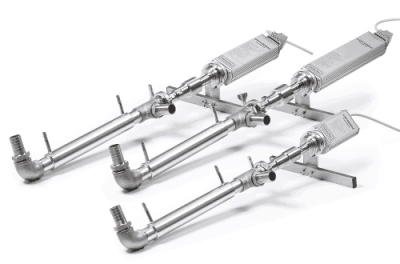 Hielscher’s ultrasonic dispersers ensure high quality dispersions, while being very effective, reliable, and cost-efficient. Conductive ink has – as its name indicates – the functionality of electrical conductivity. To prepare conductive inks and coatings, components that conduct electricity (conductive fillers) must be very uniform dispersed into the ink base. Nanoparticles such as silver, copper, CNTs, graphene, graphite, other metal-coated particles and nanocomposites are incorporated for high conductivity. Ultrasonic processors create extremely intensive shear forces, by which van der Waals forces and molecular bondings can be overcome. 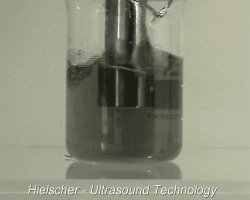 Ultrasonic dispersion is the preferred technique to disperse nanoparticles, since sonication gives a very narrow grain size distribution, high particle functionalities and reproducible results. 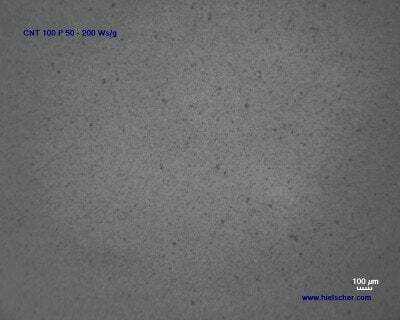 In order to impart insulating properties into an composite, dielectric particles such as SiO2, ZnO, alumina-epoxy nanocomposites amongst others must be dispersed homogeneously as single particles into the matrix. Ultrasonic dispersing ensures that agglomerates are broken so that the nanoparticles are well dispersed. A very narrow particle distribution is crucial to obtain a reliable dielectric functionality of the material. Powerful ultrasonic systems ensure the reliable dispersion of nanoparticles – on lab and bench-top level up to fully industrial scale. 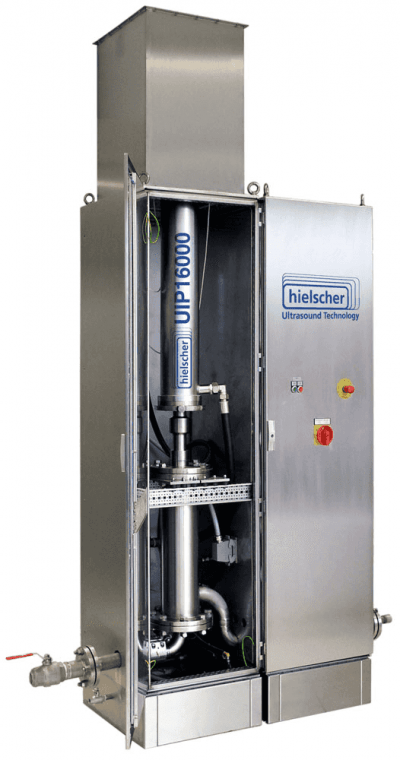 in comparison to other ultrasonic suppliers, Hielscher’s ultrasonic system are capable to deliver very high amplitudes of up to 200µm – continuously run in 24/7 operation and with simple sonotrode shapes. If an application requires even higher amplitudes and/or very high temperatures, Hielscher offers customized ultrasonic sonotrodes, which can deliver amplitudes of >200µm and inserted into very hot environments (e.g. for sonication of metal melts). The robustness of Hielscher’s ultrasonic equipment fullfils industrial standards. All our equipment is built for 24/7 operation at heavy duty and in demanding environments. Nanoparticles (NPs) offer unique material characteristics, which can differ drastically from the material’s bulk characterics. Nanomaterials come in manifold shapes. They can have a extremely high aspect ratio of 1:1,000,000 (e.g. nanotubes) or perfectly sherical shape. Beside tubes and spheres, nanoparticles have the form of rods, wires, whiskers, nanoflowers, fibres, flakes and dots. Size and shape of nanoparticles play an important role regarding the NPs properties such as tensile strength, flexibility, thermomechanical, conductive, dielectric, magnetic, and optical properties. To impart those functionalities into composites, NPs must be dispersed and blended uniformly into the matrix. To obtain such a high quality dispersion, ultrasonication is the preferred dispersing technique. Electrically conductive nanoparticles are widely used to give inks and coatings the capacity of electrical conduciveness. Nano-silver (nano-Ag) is one of the most used nanofillers in conductive inks. Silver-based conductive inks can be formulated as water-based and screen-printable inks, which are flexible and crease resistant. Conductive inks are conductive polymers (polyaniline, polythiophene or polypyrroles, etc. ), which can be deposited via ink-jet printing, spin-coating etc. Common electro-conductive inks can be classified into three categories corresponding to their conductive components, which can be either noble metals, conductive polymers, or carbon nanomaterials. Conductive inks have a wide application range and are used in the manufacturing of electronics, packaging (PET and plastic films), sensors, antennae, RFID tags/labels, touch screens, OLED displays, printed heaters and many others. PEDOT:PSS [poly(3,4-ethylenedioxythiophene) poly(styrenesulfonate)] is one of most heavily used conductive polymers, which offer besides its high conductivity a transparent appearance. By adding a network of carbon nanotubes, silver nanowires and/or graphene, the conductivity of PEDOT:PSS can be significantly enhanced. Modified PEDOT:PSS inks and formulations are available for different coating and printing processes. Water-based PEDOT:PSS inks are mainly used in slot die coating, flexography, rotogravure and inkjet printing. Dielectric inks and coatings are electrically non-conductive and are used in the screen printing of electronic circuit boards in order to built an insulating layer for the protection and enhancement conductive materials. Dielectric nanoparticles are used to give inks, pastes and coatings an insulating capacity.